Our Personalized Fire Pit program allows you to choose from 32 images and 20 characters of text to be cut into both sides of our rustic handcrafted fire pit, to create a one-of-a-kind, personalized product. Be the first on your block to have this uniques fire pit option! Patina makes a sturdy and stylish fire pit sure to fit in with any of your existing outdoor decor! We do have many more logos, so if you do not see one from the list of 32, give us a call and let us know what you are looking for. We have had orders for family names, nicknames, club names, groups and even bed and breakfasts have ordered for their venue. If you gave any questions please give us a call and we can help you place your order. 2. 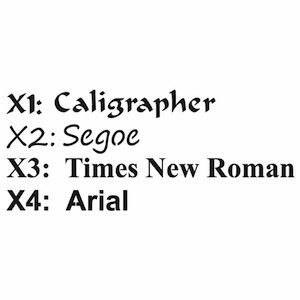 Please SELECT A "FONT" IN THE PULL-DOWN MENU ABOVE BEFORE PLACING YOUR ORDER. 3. 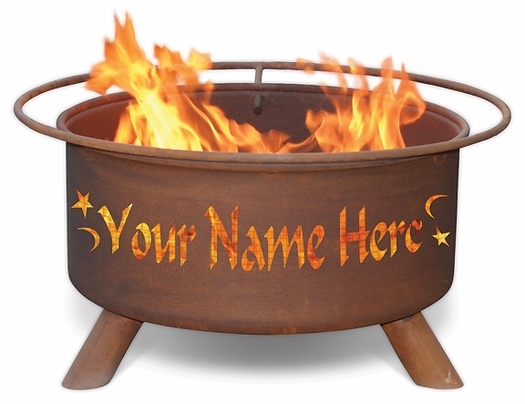 Please LET US KNOW WHICH NAME YOU WOULD LIKE us to put on your Fire Pit. Please Enter the NAME in the "COMMENTS" AREA On Your ORDER CHECK-OUT Page. The Name on your Fire Pit can be up to 20 characters PER SIDE including spaces and punctuation.